Although B cells have been shown to possess a regulatory function, microenvironmental factors or cytokines involved in the induction of regulatory B cells remain largely uncharacterized. B cell-activating factor (BAFF), a member of TNF family cytokines, is a key regulator for B cell maturation and function. In this study, we detected significantly increased numbers of IL-10–producing B cells in BAFF-treated B cell cultures, an effect specifically abrogated by neutralization of BAFF with TACI-Fc. BAFF-induced IL-10–producing B cells showed a distinct CD1dhiCD5+ phenotype, which were mainly derived from marginal zone B cells. Moreover, BAFF activated transcription factor AP-1 for binding to IL-10 promoter. Notably, BAFF treatment in vivo increased the number of IL-10–producing B cells in marginal zone regions. Furthermore, BAFF-induced IL-10–producing B cells possess a regulatory function both in vitro and in vivo. Taken together, our findings identify a novel function of BAFF in the induction of IL-10–producing regulatory B cells. Extensive studies have demonstrated the prominent functions of B cells in Ab production and Ag presentation; however, certain B cell subsets have been recognized as immune regulators through cytokine production (1). Early studies revealed a suppressive role of B cells via IL-10 production in the pathogenesis of experimental autoimmune encephalomyelitis (2, 3). Lines of evidence have shown the existence of regulatory B cells in murine models of collagen-induced arthritis (CIA) (4). Transitional 2 (T2)-marginal zone (MZ) precursor B cells have been shown to suppress the development of experimental arthritis and lupus in mice (5, 6). Recently, studies by Yanaba et al. (7, 8) have characterized an IL-10–producing regulatory B cell subset with a unique CD1dhiCD5+ phenotype. Although accumulating data indicate that IL-10–producing B cells possess a regulatory function in the development of autoimmune diseases, microenvironmental factors and/or cytokines involved in inducing regulatory B cell differentiation remain largely uncharacterized (9, 10). B cell-activating factor (BAFF), a member of TNF family cytokines, is a key regulator for B cell maturation and survival. Analyses of BAFF-deficient mice reveal a fundamental role of BAFF during the transition from immature T1 to T2 B cells (11). In addition to its crucial role in the maintenance of peripheral B cell pool, BAFF has been found to be essential for MZ B cell development (12). New evidence from BAFF-transgenic mice indicates that BAFF induces CD4+Foxp3+ T cells to suppress T cell response through an indirect B cell-dependent manner, suggesting a regulatory role of BAFF in vivo (13). In this study, we report a novel function for BAFF in inducing the differentiation of IL-10–producing B cells with a CD1dhiCD5+ phenotype. Moreover, we show that BAFF-induced IL-10–producing B cells are mainly differentiated from the MZ B cell subset with a regulatory function in suppressing T cell proliferation and Th1 cytokine production. Furthermore, in vivo transfer of BAFF-induced CD1dhiCD5+ B cells significantly inhibited the arthritis development in CIA mice. Thus, our findings identify a novel role of BAFF in inducing regulatory B cell differentiation. DBA/1J, C57BL/6, NOD, and B6.IL-10−/− mice were purchased from The Jackson Laboratory (Bar Harbor, ME). B6.IL-10−/− mice backcrossed to the DBA/1J background for 10 generations were used in this study. All experimental protocols were approved by the Institutional Animal Care and Use Committee. Unless otherwise indicated, all Abs were obtained from BioLegend (San Diego, CA), and reagents were from R&D Systems (Minneapolis, MN). Splenic B cells were purified with CD19 or B220 mAb-coated microbeads (Miltenyi Biotec, Bergisch Gladbach, Germany), and the purity was >95%. Purified B cells were cultured in the presence or absence of recombinant BAFF (20 ng/ml) for 72 h. For intracellular staining of IL-10, PMA (50 ng/ml; Sigma-Aldrich, St. Louis, MO), ionomycin (500 ng/ml; Sigma-Aldrich), and monensin (2 μM; BioLegend) were added to the culture for the last 5 h before flow cytometric analysis (8). In separate experiments, B cell subsets were sorted with an Epics Altra flow cytometer (Beckman Coulter, Fullerton, CA), and the purity was routinely >96%. Cytospin-prepared slides of cultured B cells and frozen sections of spleens were fixed in acetone at −20°C for 10 min, blocked in 1% BSA, stained with CD19-PE and IL-10-FITC, mounted, and monitored under microscope (Axiovision; Zeiss, Oberkochen, Germany). The expression levels of IL-10, BAFF receptor (BR3), B cell maturation Ag (BCMA), transmembrane activator and calcium-modulator and cyclophilin ligand-interactor (TACI), and AP-1 transcripts were measured by real-time PCR as previously described (14), in which fold differences were calculated with normalization to GAPDH and controls. The chromatin immunoprecipitation (ChIP) assay was conducted using the ChIP assay kit following the manufacturer’s protocol (Upstate Biotechnology, Lake Placid, NY). Briefly, purified MZ-B cells were treated with BAFF for 15 and 120 min, respectively. Normal rabbit IgG and c-Jun Abs (Cell Signaling Technology, Beverly, MA) were used to immunoprecipitate DNA fragments. PCR then was conducted by using IL-10 promoter specific primers: sense, 5′-TTGGGTAACTGA GTGCTAA-3′, and antisense, 5′-GAACTGGTC GGAATGAA-3′. Purified splenic B cells or B cell subsets were cultured in IL-10–coated Multiscreen 96-well plates (Millipore, Billerica, MA) for 72 h and detected by AP-conjugated goat anti-mouse IgG (H+L). For cytokine detection, ELISA plates were coated with anti-mouse IL-10 or IFN-γ, and cytokine levels were detected with IgG1-HRP as described previously (15). Sorting-purified and CFSE-labeled CD4+CD25− T cells (5 × 105 cells/well) were cultured in a 24-well plate precoated anti-CD3 (2 μg/ml) and anti-CD28 (2 μg/ml). Purified CD19+ B cells or BAFF-induced CD1dhiCD5+ B cells from wild-type DBA or IL-10−/− mice were cocultured with those T cells at a ratio of 1:1 for 72 h before flow cytometric analysis. DBA/1J mice were i.v. injected with 100 μg BAFF protein. Three days later, both splenocytes and frozen sections were prepared for flow cytometric analysis and immunofluorescence microscopy, respectively. The CIA was induced in DBA/1J mice as described previously (15, 16). On the day of second immunization, 5 × 105 BAFF-induced CD1dhiCD5+ B cells from wild-type DBA or IL-10−/− mice were transferred to mice in the treatment group by i.v. injection. Eight weeks later, serum titers of CII-specific-IgG were measured by ELISA as reported previously (16). Unless otherwise indicated, statistical analysis was performed using the unpaired Student t tests. A value of p < 0.05 was considered significantly different. To evaluate the effect of BAFF on B cell differentiation and cytokine production, we cultured splenic CD19+ B cells, pretreated with or without TACI-Fc (a soluble BAFF blocker), in the presence of BAFF for 72 h. ELISPOT analysis showed that BAFF treatment significantly increased the frequency of IL-10–producing B cells, an effect specifically abrogated by the neutralization of BAFF with TACI-Fc (Fig. 1A). Moreover, the elevated levels of IL-10 in culture supernatant were confirmed by a standard ELISA assay (Fig. 1A, Supplemental Fig. 1A). Upon increasing its concentrations from 2 to 20 ng/ml, BAFF treatment significantly increased the frequency of IL-10+ B cells in a linear fashion, with its maximal effect detected at a concentration of 50 ng/ml. However, a higher concentration of BAFF (200 ng/ml) resulted in markedly reduced frequency of IL-10–producing B cells in culture (Fig. 1B). Flow cytometric analysis revealed that the percentages of IL-10+ B cells were substantially increased from 0.8 ± 0.2 to 6.5 ± 1.2% during a 3-d culture of BAFF-treated B cells (Fig. 1C), which was further confirmed by immunofluorescent microscopy (Fig. 1D), indicating that BAFF treatment can induce IL-10 production in splenic B cells. Accordingly, BAFF was shown to induce the expansion of IL-10+ B cells in culture (Supplemental Fig. 1B). However, BAFF showed no synergistic effect on IL-10 induction with either LPS or anti-CD40 treatment (Supplemental Fig. 2). BAFF induces IL-10–producing B cell differentiation in vitro. A, Frequencies of IL-10–producing B cells determined by ELISPOT. Splenic CD19+ B cells were incubated in the presence or absence of BAFF (20 ng/ml) for 72 h with B cells pretreated with TACI-Fc (200 ng/ml) as control. Results represent mean values of spot-forming cells per 105 CD19+ B cells from eight independent experiments. ELISA determinations of IL-10 secretion in culture supernatants are also shown (mean ± SEM); **p < 0.01. B, Splenic CD19+ B cells were cultured with BAFF at various concentrations for 72 h, and the number of IL-10–secreting B cells was determined by ELISPOT. Data represents five separate experiments. C, Flow cytometric analysis of IL-10–producing B cell. B cells from wild-type DBA and IL-10−/− mice were treated with BAFF for 72 h. PMA, ionomycin, and monensin (PIM) were added for the last 5 h before immunostaining. Percentages indicate mean values (± SEM; n = 6). D, Cytospin preparations of cultured B cells with or without BAFF treatment were stained with CD19-PE and IL-10-FITC (IgG2a, κ-FITC as isotype control). The arrows indicate CD19+IL-10+ B cells (original magnification ×200). E, Phenotypic analysis of IL-10+ (thick line) or IL-10− (thin line) B cells from BAFF-treated B cell cultures for 72 h by flow cytometry. PIM were added to the culture for the last 5 h. Gray-shaded histograms indicate the isotype staining. Results represent three independent experiments. To characterize BAFF-induced IL-10–producing B cells, flow cytometric analysis revealed that IL-10+ B cells displayed a CD21hiCD23lo phenotype similar to MZ B cells. IL-10+ B cells were also positively stained for CD5 with high levels of CD1d expression (Fig. 1E), which expressed moderate levels of CD80, CD86, CD43, CD40, and CD83 but exhibited high densities of MHC class II. Furthermore, CD1dhiCD5+ B cells were the major subset responsible for the IL-10 secretion (Supplemental Fig. 3). To identify the B cell subset(s) from which IL-10–producing B cells were differentiated, sorting-purified newly formed (NF) B cells, MZ B cells, and follicular (FO) B cells were cultured with BAFF (20 ng/ml). We found that IL-10–producing B cells were mainly derived from the MZ B cell subset, whereas very few IL-10+ B cells generated from FO cell fraction (Fig. 2A). However, no IL-10+ B cells were detected from cultured NF B cells. These data indicate a role of BAFF in preferentially inducing MZ B cell differentiation into IL-10–producing B cells. BAFF induces IL-10 production in MZ B cells. A, Splenic NF (CD21loCD23lo), FO (CD21loCD23hi), and MZ (CD21hiCD23lo) B cells were sorting-purified and cultured with or without BAFF for 72 h. The frequencies of IL-10–producing B cells were determined by ELISPOT. Values represent mean numbers of spot-forming cells per 105 B cells from five independent experiments; **p < 0.01. B, Expression of BAFF receptor transcripts in FO B cells (□) and MZ B cells (▪) evaluated by real-time PCR analysis. Values represent mean ratios of BR3, BCMA, and TACI transcripts normalized to GAPDH transcript levels. Results are representative of three independent experiments; *p < 0.05; **p < 0.01. C, Expression of BAFF receptors on MZ B cells (thick line) and FO B cells (thin line) determined by flow cytometry. Gray-shaded histograms indicate the isotype staining. Results represent three independent experiments. D, Sorting-purified MZ B cells from normal mice were treated with BAFF for various time intervals. Values represent mean ratios of IL-10 and AP-1 transcripts normalized to GAPDH transcript levels as quantified by real-time PCR. Results are representative of three independent experiments; *p < 0.05; **p < 0.01. E, ChIP analysis of AP-1 (c-Jun) binding to the IL-10 promoter in BAFF-stimulated MZ B cells. Sorting purified MZ B cells were treated with BAFF for 15 or 120 min, respectively. Immunoprecipitations were conducted using either c-Jun or normal rabbit IgG-specific Abs. Samples were normalized to input DNA controls. 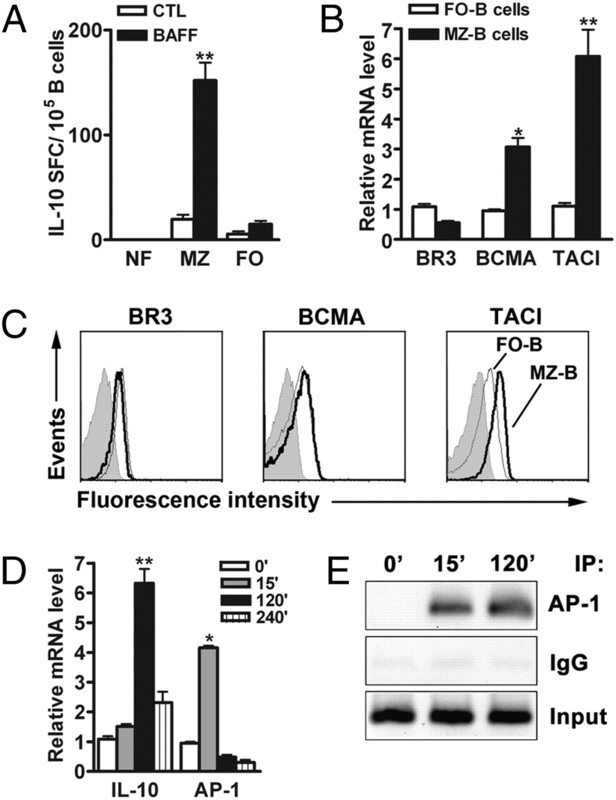 To assess whether MZ and FO B cells differentially express BAFF receptors, quantitative PCR analysis of RNA samples from freshly purified B cell subsets revealed that MZ B cells expressed much higher levels of TACI and BCMA mRNA expression with a lower level of BR3 transcripts when compared with FO B cells (Fig. 2B), which were consistent with the immunofluorescent staining profile of BAFF receptors on MZ and FO B cells by flow cytometry (Fig. 2C). Furthermore, we prepared mRNA samples from BAFF-treated MZ B cells at various time intervals and screened a panel of transcription factors for IL-10 gene by real-time PCR analysis. As shown in Fig. 2D, AP-1 exhibited a rapid 4-fold increase only 15 min after BAFF stimulation. Notably, IL-10 transcripts in MZ B cells displayed a 6-fold increase upon BAFF treatment. Further analysis by a ChIP assay demonstrated that BAFF stimulation activated AP-1 (c-Jun) for binding to IL-10 promoter region (Fig.2E). To determine whether BAFF exerts any effects on IL-10–producing B cell differentiation in vivo, we i.v. injected BAFF protein into normal mice and examined both frequencies and absolute numbers of IL-10–producing B cells in the spleen 3 d after treatment. Flow cytometric analysis showed an ∼4-fold increase in the frequencies of IL-10–producing B cells (Fig. 3A). Moreover, immunofluorescent microscopy revealed that CD19+ IL-10–producing B cells were mainly located at MZ regions in BAFF-treated mice (Fig. 3B). Thus, these results indicate that increased levels of BAFF enhance the generation of IL-10–producing B cells in vivo. 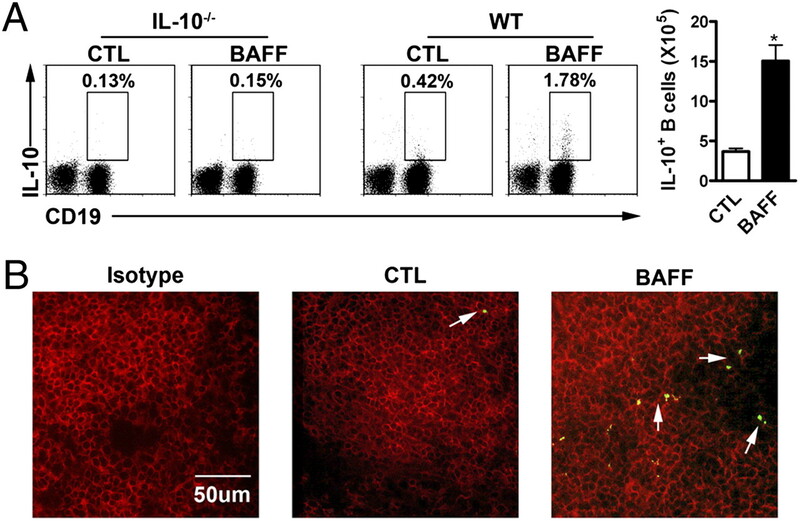 BAFF promotes the differentiation of IL-10+ B cells in vivo. A, Frequencies of splenic IL-10+ B cells from wild-type DBA and IL-10−/− mice with or without BAFF treatment (100 μg/mouse) as detected by flow cytometry. PIM stimulation was performed for 5 h before IL-10 staining. The absolute numbers of IL-10+ B cells in the spleens were also shown (n = 5; *p < 0.05). B, Frozen sections of spleens from BAFF-treated wild-type DBA mice were immunostained with CD19-PE and IL-10-FITC. The arrows indicate the CD19+ IL-10+ B cells located at the MZ regions (original magnification ×100). 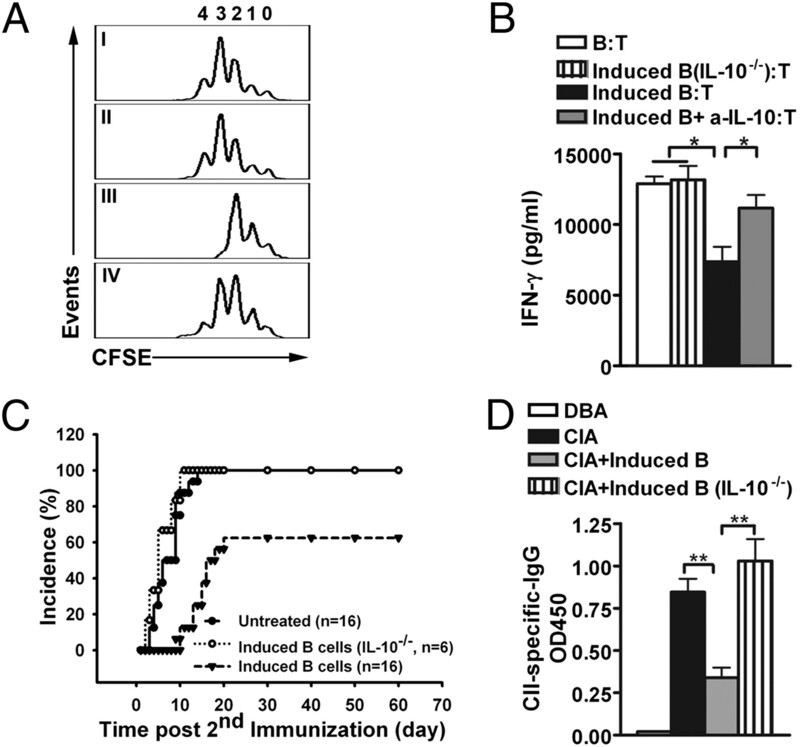 To verify whether BAFF-induced IL-10–producing B cells possess a regulatory function, we purified BAFF-induced CD1dhiCD5+ B cells from both wild-type DBA and IL-10−/− mice and incubated them with CD3/CD28-activated T cells (Fig. 4A). T cell proliferation was significantly suppressed by BAFF-induced CD1dhiCD5+ B cells from wild-type mice but not those from IL-10−/− mice. Moreover, treatment of cocultures with anti–IL-10 mAb abrogated the inhibitory effects of B cells on T cell proliferation, suggesting that the suppressive function of BAFF-induced B cells is mediated by IL-10. Further analysis by ELISA revealed significantly reduced levels of IFN-γ in the supernatant of cocultured T cells with wild-type CD1dhiCD5+B cells (Fig. 4B). BAFF-induced CD1dhiCD5+ B cells possess a regulatory function both in vitro and in vivo. A, CFSE-labeled CD4+CD25− T cells (T) were cocultured with CD19+ B cells (B) (I), CD1dhiCD5+ B cells from BAFF-treated IL-10−/− B cells (induced B [IL-10−/−]) (II), CD1dhiCD5+ B cells from BAFF-treated wild-type B cells (induced B) (III), and BAFF-induced wild-type CD1dhiCD5+ B cells pretreated with anti–IL-10 mAb (200 ng/ml) at a ratio of 1:1 for 72 h (IV). T cell proliferation was evaluated by flow cytometry. Results represent four independent experiments. B, ELISA determinants of IFN-γ secretion in the supernatant from above cocultures (n = 8) were shown (mean ± SEM; *p < 0.05). C, Purified BAFF-induced CD1dhiCD5+ B cells (5 × 105 cells) from wild-type or IL-10−/− mice were i.v. transferred into immunized mice on the day of second immunization. Control CIA mice were left untreated. The incidence of arthritis development in immunized mice were monitored and compared by statistical analysis using the Fisher’s exact test (p < 0.05). D, Serum levels of CII-specific autoantibodies in normal DBA/1J, control CIA, wild-type CD1dhiCD5+ B cell-transferred CIA, and IL-10−/− CD1dhiCD5+ B cell-transferred CIA mice were measured by ELISA. Values are the mean ± SEM derived from six mice per group (**p < 0.01). To further ascertain a regulatory role of BAFF-induced B cells in a mouse model of CIA, we i.v. transferred BAFF-induced CD1dhiCD5+ B cells from both wild-type and IL-10−/− mice (5 × 105) into DBA/1J mice on the day of second immunization with CII/IFA. Notably, only 60% of mice treated with wild-type CD1dhiCD5+ B cells developed arthritis as compared with 100% in control CIA mice (Fig. 4C). Moreover, an average of 10-d delay in arthritis onset was observed in CIA mice following B cell transfer. However, transfer of CD1dhiCD5+ B cells from IL-10−/− mice showed no protective effect on CIA development. As shown in Fig. 4D, serum levels of anti-CII Abs were significantly reduced in wild-type CD1dhiCD5+ B cells-treated CIA mice. Further histological examination revealed markedly reduced joint pathology in mice treated with transferred B cells (data not shown). Extensive studies have established a critical role of BAFF in driving T2 B cell differentiation into FO B cells, post-GC B cell maturation, plasma cell generation, and Ab production (17). In this study, we provide new evidence that exogenous BAFF at low concentrations can preferentially induce IL-10 production in MZ B cells. As a key regulator of B cell maturation and function, BAFF interacts with three receptors (BR3, BCMA, and TACI) expressed on B cells (17). BR3 and TACI differ significantly in their requirements for ligand oligomerization for transmitting BAFF signaling, whereas BAFF levels can further affect whether TACI delivers either a positive or negative signal for B cell activation (18). Alternatively, the strong signals mediated by high doses of BAFF may predominantly activate the BR3-ligation–mediated nonclassical NF-κB2 pathway and lead to the transcription of antiapoptotic factor Bcl-2 for MZ B cell differentiation into plasma cells by overriding its effect on inducing cytokine production (19). Consistent with a recognized function for TACI in controlling T cell-independent B cell Ab responses, we have detected a unique pattern of BAFF receptors on MZ B cells with high levels of TACI expression when compared with FO B cells (20). Thus, it is possible that the expression pattern of BAFF receptors on MZ B cells might be closely implicated in mediating BAFF signaling effect on IL-10 induction. BAFF may lead to an expansion of IL-10–producing B cell subpopulation by several potential mechanisms, including differentiation of regulatory B cells or BAFF-induced proliferation or survival of a proliferating subpopulation of IL-10–producing B cells. Our current data do not rule out the latter possibilities. Numerous studies have demonstrated that the rapid activation of MZ B cells is responsible for the early Ab response to blood-borne pathogens (21). Although MZ B cells have been shown to possess the capacity of directly priming naive CD4+ T cells and driving their differentiation into effector T cells, it has become clear that functional interaction of MZ B cells with dendritic cells (DCs) during a T-independent Ab response is critically mediated by DC-produced BAFF in a CD40-CD40L–independent manner (22). Our current data indicate that BAFF at low doses can induce IL-10 production in MZ B cells possibly via the direct activation of several transcription factors for the IL-10 gene. Because MZ B cells are anatomically surrounded by BAFF-producing DCs and macrophages in vivo, future studies would provide new insight in understanding the role of BAFF in regulating MZ B cell function. Although BAFF has been generally considered as a driving factor for its proinflammatory function, we have demonstrated that BAFF induces MZ B cell differentiation into IL-10–producing B cells with a regulatory function both in vitro and in vivo. These findings support the notion that BAFF plays a dual role in modulating B cell maturation and function. Our data show that CD5+CD1dhi B cells isolated from BAFF-treated culture can suppress autoimmunity in an IL-10–dependent fashion. However, the data do not address whether BAFF-dependent signals in vivo are necessary to induce the suppressive activity of these cells. Further studies are warranted to determine whether increased BAFF expression is involved in the expansion of IL-10–producing regulatory B cells under autoimmune conditions and to validate the potential application of regulatory B cells as a novel cellular therapy for the treatment of human autoimmune diseases. This work was supported by grants to L.L. from the Research Grants Council of Hong Kong and the National Natural Science Foundation of China and Hong Kong Research Grants Council Joint Research Scheme. transmembrane activator and calcium-modulator and cyclophilin ligand-interactor.
. 2000. Reciprocal regulation of polarized cytokine production by effector B and T cells. Nat. Immunol. 1: 475–482.
. 1996. Experimental autoimmune encephalomyelitis induction in genetically B cell-deficient mice. J. Exp. Med. 184: 2271–2278.
. 2002. B cells regulate autoimmunity by provision of IL-10. Nat. Immunol. 3: 944–950.
. 2003. Prevention of arthritis by interleukin 10-producing B cells. J. Exp. Med. 197: 489–501.
. 2007. Novel suppressive function of transitional 2 B cells in experimental arthritis. J. Immunol. 178: 7868–7878.
. 2009. Selective targeting of B cells with agonistic anti-CD40 is an efficacious strategy for the generation of induced regulatory T2-like B cells and for the suppression of lupus in MRL/lpr mice. J. Immunol. 182: 3492–3502.
. 2008. A regulatory B cell subset with a unique CD1dhiCD5+ phenotype controls T cell-dependent inflammatory responses. Immunity 28: 639–650.
. 2009. The development and function of regulatory B cells expressing IL-10 (B10 cells) requires antigen receptor diversity and TLR signals. J. Immunol. 182: 7459–7472.
. 2006. A case for regulatory B cells. J. Immunol. 176: 705–710.
. 2008. Regulatory B cells as inhibitors of immune responses and inflammation. Immunol. Rev. 224: 201–214.
. 2001. An essential role for BAFF in the normal development of B cells through a BCMA-independent pathway. Science 293: 2111–2114.
. 2001. Maturation of marginal zone and follicular B cells requires B cell activating factor of the tumor necrosis factor family and is independent of B cell maturation antigen. J. Exp. Med. 194: 1691–1697.
. 2009. Increased CD4+Foxp3+ T cells in BAFF-transgenic mice suppress T cell effector responses. J. Immunol. 182: 793–801.
. 2008. Natural killer cell degeneration exacerbates experimental arthritis in mice via enhanced interleukin-17 production. Arthritis Rheum. 58: 2700–2711.
. 2008. Local BAFF gene silencing suppresses Th17-cell generation and ameliorates autoimmune arthritis. Proc. Natl. Acad. Sci. USA 105: 14993–14998.
. 2005. Expression and function of TNF family member B cell-activating factor in the development of autoimmune arthritis. Int. Immunol. 17: 1081–1092.
. 2003. BAFF AND APRIL: a tutorial on B cell survival. Annu. Rev. Immunol. 21: 231–264.
. 2008. TACI, an enigmatic BAFF/APRIL receptor, with new unappreciated biochemical and biological properties. Cytokine Growth Factor Rev. 19: 263–276.
. 2006. Alternative and classical NFκB signaling retain autoreactive B cells in the splenic marginal zone and result in lupus-like disease. Immunity 25: 403–415.
. 2007. TACI is required for efficient plasma cell differentiation in response to T-independent type 2 antigens. J. Immunol. 179: 2282–2288.
. 2004. Development and selection of marginal zone B cells. Immunol. Rev. 197: 192–205.
. 2002. Blood dendritic cells interact with splenic marginal zone B cells to initiate T-independent immune responses. Immunity 17: 341–352.